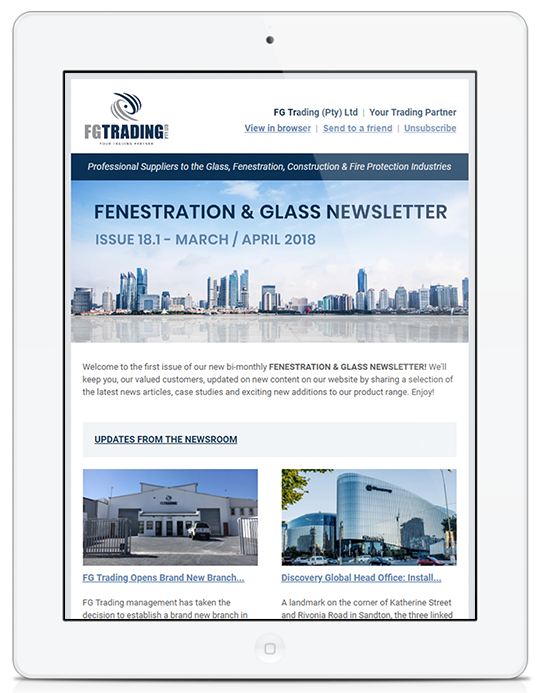 Please note that the content contained within this website including all information, specifications, data, images and recommendations for use is provided as a guide and for information purposes only and does not constitute a guarantee or create any contractual obligations between any person and FG Trading (Pty) Ltd. It remains the responsibility of the user to ensure that the product is suitable for a particular application. All content contained within this website is non-binding and subject to change without notice. Whilst website content has been provided in good faith and every care has been taken by FG Trading (Pty) Ltd to ensure that it is accurate and up to date, we do not accept any liability for any inaccuracies, omissions or errors. FG Trading (Pty) Ltd reserves the right to change, update or delete company or product information, literature, images and technical data at any time. Products and content on this website are provided 'as is' without a warranty of any type, either express or implied, including, but not limited to, the implied warranty of merchantability and fitness for a particular purpose. FG Trading (Pty) Ltd, its Contractors, Affiliates and their Directors, and Employees will not be liable for any harm, loss or any damages (whether direct, indirect, special and/or consequential) caused to any person or property of whatsoever nature and howsoever incurred, as a consequence of: the use of this website, in respect of any reliance placed upon the information provided on this website, and/or the guidelines and specifications applicable to the products and published from time to time, including, without limitation, the guidelines and specifications contained within this website. Our website contains indirect and direct references in the form of hyperlinks to various external websites which are independent of FG Trading (Pty) Ltd. Whilst the websites contained no obvious illegal or defective content when the links were created, FG Trading (Pty) Ltd has no influence or control over the present or future content of these websites and therefore we cannot endorse or accept any responsibility for their use. The respective third party providers or creators of the linked sites are exclusively responsible for their content and for any claims arising from the usage or reliance placed upon illegal, defective or inaccurate information. It remains the responsibility of the user to ensure that their computer is protected from potential threats in the form of viruses, worms, malware, adware and to verify information prior to the use or purchase of products. All content contained within this website is the property of FG Trading (Pty) Ltd and/or its suppliers. All rights to the intellectual property on this website including copyright, trademarks, and patents as well as text, documents, photography, images, illustrations, company logos and videos are reserved, either by FG Trading (Pty) Ltd or the respective third party. Access to this website does not grant the user permission to utilise, duplicate or reproduce its content in any other electronic or printed media without the consent of FG Trading (Pty) Ltd and/or its suppliers. The contents of this website are intended solely for informative, non-commercial purposes and may be used, copied and distributed provided that they are not modified or altered in any way and on condition that it is exclusively for the intent of specification, purchasing or use of the products.